Home Lifestyle Art & Entertainment Captioned Theatre: Behind the Scenes! I can’t recall watching a captioned Theatre show in the past, so it was certainly a new, exciting, inclusive experience for me. I’ve watched non-captioned shows before, and it is challenging not knowing what they’re saying or singing. Lipreading from a distance is almost impossible, and it’s stressful trying to work out the storyline. Therefore, we can never really sit back, relax and watch the show like our hearing peers can… but, captions open a whole new world and does all of the translating for you! To be able to watch a captioned show of a musical I love so much, words can’t describe how I thoroughly enjoyed Mamma Mia, because I could understand everything that was going on! It was also lovely to be able to dance and sing along with the audience! From now on, I’ll only watch captioned performances, because why should I pay for a show without captions that I can’t understand? But, let’s get to the detail… I went behind the scenes to find out more about how captioning works! 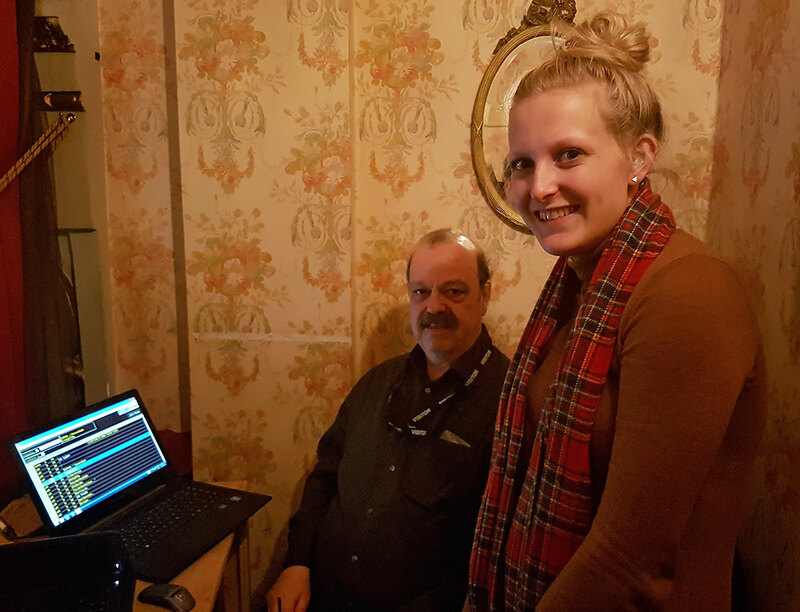 Behind the Scenes: Meeting the Captioner! I had the opportunity to meet Glenn Hathaway, the captioner before the show started to ask a few questions. It was incredibly interesting to chat with him… here are a few things I found intriguing! Glenn realised that people in the audience think the captions are automatic but they don’t realise they are controlled by a person! Stagetext Captions wouldn’t work live because the script is pre-loaded and is hard to make changes once it’s rolling – for live events, a Speech-to-Text Reporter who types verbatim (word for word) is better! Last of all, he ‘loves musicals, as they rarely get the words wrong!’ – Plus, it has perks being able to watch the shows whilst working! It’s fascinating the different types of captioning that Stagetext (link: www.stagetext.org/ ) accommodates, from theatre captions, to museum captioned tours and live event captions. Most importantly, aiming to fulfil the captioning users’ requirements for accessibility! 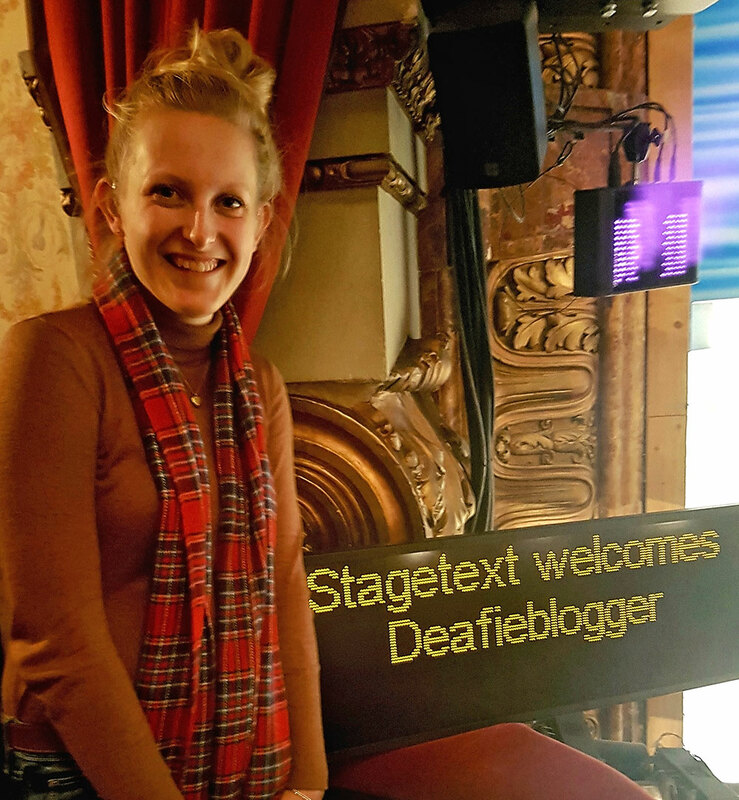 I found it really awesome that Stagetext like to work with these industries to improve accessibility and to raise awareness of deafness and the benefits that captioning brings to them, and to others. Also, they discuss with staff about emergency plans, attitudes towards deafness and how to make it an inclusive, enjoyable experience for them. If you ever get a chance to watch a captioned show, I definitely recommend it! A relaxing, fun experience – guaranteed!